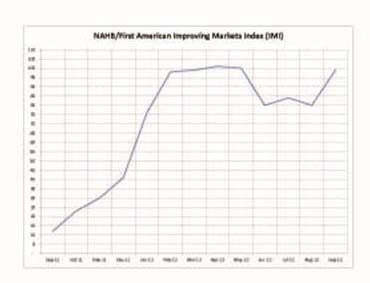 The number of improving housing markets across the country rose to 99 in September, according to the National Association of Home Builders/First American Improving Markets Index (IMI), released today. This is up from 80 metros that were listed as improving in August and includes representatives from 33 states as well as the District of Columbia. The index identifies metropolitan areas that have shown improvement from their respective troughs in housing permits, employment and house prices for at least six consecutive months. Markets added to the list in September include such geographically diverse locations as Tucson, Ar. ; Jacksonville, Fl. ; Springfield, Il. ; Greenville, N.C.; and Bend, Or. “The number of improving housing markets grew by 19 in September as 68 metros retained their spots, 31 new metros were added and just 12 dropped off the list,” noted Barry Rutenberg, chairman of the National Association of Home Builders (NAHB) and a home builder from Gainesville, Fl. “This solid growth is an encouraging sign that housing continues on a slow but steady recovery path that is gradually advancing from one local market to the next.” “More metros across the country are experiencing a sustained uptick in house prices, employment and new building activity as rising consumer confidence in local market conditions pushes more people to consider a new-home purchase,” observed NAHB Chief Economist David Crowe. “That said, overly tight lending conditions for builders and buyers continue to slow this process considerably.” “Combined with recent positive reports on builder confidence, housing starts and new-home sales, the September IMI adds to the growing consensus that housing is finally moving in the right direction, which in turn is spurring more potential buyers to get off the fence,” added Kurt Pfotenhauer, vice chairman at First American Title Insurance Company. Builder confidence in the market for newly built, single-family homes rose for a fifth consecutive month in September to a level of 40 on the NAHB/Wells Fargo Housing Market Index (HMI), released this week. The latest three-point gain brings the index to its highest reading since June of 2006. All three HMI components posted gains in September. While the component gauging current sales conditions increased four points to 42, the component gauging sales prospects in the next six months rose eight points to 51 and the component measuring traffic of prospective buyers edged up one point to 31. Builder confidence also rose across every region of the country in September. Looking at the three-month moving average for each region, the Midwest and West each registered five-point gains, to 40 and 43, respectively, while the South posted a four-point gain to 36 and the Northeast posted a two-point gain to 30. Describing the latest HMI results, NAHB Chief Economist David Crowe said that "Builders across the country are expressing a more positive outlook on current sales conditions, future sales prospects and the amount of consumer traffic they are seeing through model homes than they have in more than five years," but noted that concerns are now rising about the lack of building lots in certain markets and the increasing cost of building materials. Nationwide housing production rose 2.3% to a seasonally adjusted annual rate of 750,000 units in August, according to figures released by HUD and the U.S. Census Bureau on Sept. 19. This increase was fueled entirely by gains in the single-family sector, where the pace of new construction rose in every region for a combined 5.5% gain to 535,000 units -- the best pace recorded since April of 2010. NAHB Chief Economist David Crowe called the latest data "further evidence that the housing recovery is here to stay," but noted that obstacles such as tight credit, poor appraisals and rising materials costs are constraining the pace of that recovery. Multifamily housing production, which tends to bump up and down from month to month, declined 4.9% to a seasonally adjusted annual rate of 215,000 units following very strong months in June and July. Regionally, combined starts numbers were mixed, with the Midwest and South posting gains of 20.7% and 3.7%, respectively, and the Northeast and West posting respective declines of 12.6% and 4.3%. However, single-family starts rose in every region in August. The same government report noted that Issuance of new building permits edged down one percent to a rate of 803,000 units in August following a surge in the previous month, with single-family permits holding virtually unchanged at 512,000 units and multifamily permits down 3% to 291,000 units. Regionally, combined permitting activity rose 7.9% in the Midwest and 0.7% in the South, but declined 7.7% in the Northeast and 6.4% in the West in August. 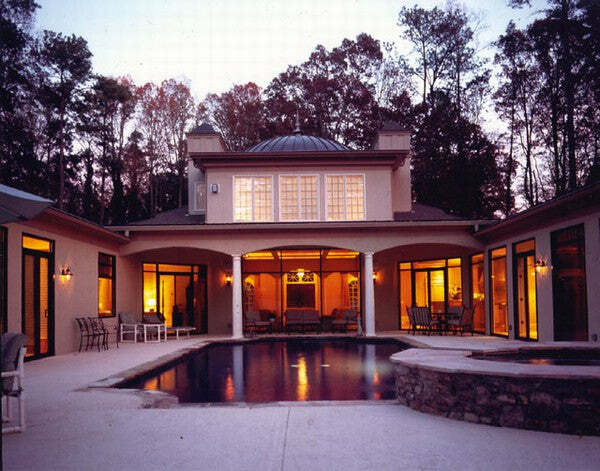 Today's photos are that of Archival Dsesigns' Villa De Saye luxury house plan. Choose from more than 400 house designs and house plans. 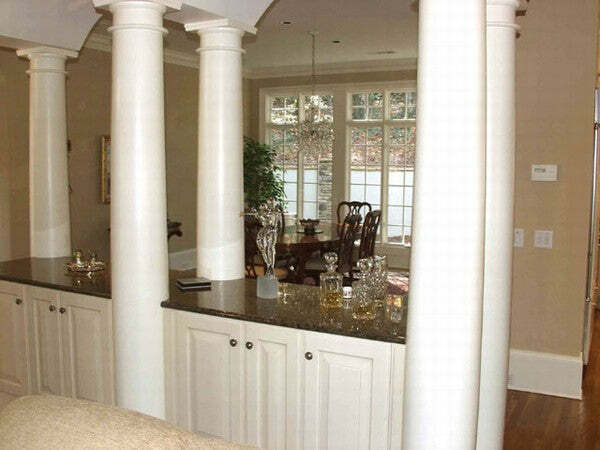 We offer house designs in a wide range of styles and sizes. 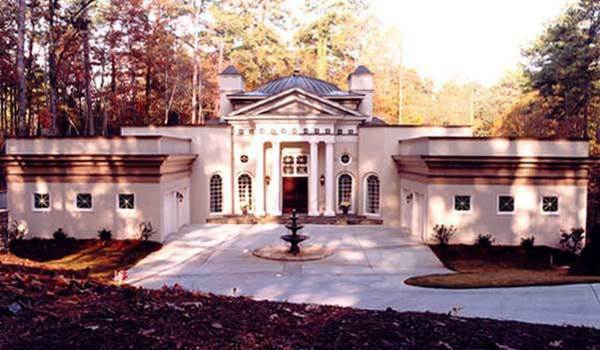 Some of our more popular house designs include European-inspired Georgian and Palladian homes, English Manor house plans, Tuscan-style Italian villas, French chateaux and colonial house plans. Our Tuscan-style villas range from 1800 sf to 13,600 sf. Our Newport classic house designs range from 1500 to 5000 square feet. Our starter castles, mansions and estate homes are designed in the grand tradition of some of the most impressive homes in the world. Please feel free to search our house designs or browse our photo gallery to get a sense of the many styles and types of house designs we offer. Our plans have been built around the globe, from Canada to Dubai, and one plan could be just for you!